Copyright © Memoirs of Dimitri D. Dimancescu (1896-1984) SEE c.v. Subsequent to military service in World War One, Dimancescu traveled to the United States where he was admitted to Carnegie Institute of Technology (now Carnegie Mellon Univ.) in Pittsburgh. Though not speaking English when he entered, he graduated with honors in Engineering in 1922. A few days after I received my diploma. the Romanian Minister in Washington, Anton Bibescu, came to Pittsburgh to meet Romanian students there. Besides myself, a graduate of Carnegie Tech, there were eleven other students at the University of Pittsburgh, all of them studying petroleum engineering. They considered themselves superior to me. They all still had one more year of studies. Bibescu invited us all to dinner in his suite at the William Penn Hotel. He seated each of us by age. On his right was George Anagnostache and on his left, Ionel Gardescu. I was at the head of the table – I was not the youngest, but I was no longer a student. Bibescu’s style was to pose questions and expect very short answers. Anagnostache was a quiet man with slow reactions, while Gardescu was at home anywhere. (He was the son of General Gardescu.) Bibescu assaulted the group with questions that were at first personal and then jumped to other subjects. One of the questions was which was the better of two universities: Carnegie Tech or Pittsburgh University? He was answered by a chorus: “Pittsburgh University.” Actually Pittsburgh was a much larger school. It had a large faculty and was backed by the house of Mellon. Carnegie was a newer and relatively small school with only engineering and arts departments. It was backed by the wealth of Andrew Carnegie who wanted a “school of intelligent, but not necessarily rich boys.” . At the end of the dinner, Bibescu invited each us one at time in the next room for a confidential talk. Each was asked: “Do you need any money and how much?” At the end each student received from $300 to $500. These interviews were short. When my turn came, he asked me the same question to which I answered that I did not need money. Despite his insistence I refused. He said, “You must be an extraordinary person. Your colleagues told me that you have six mistresses and are an embarrassment to the Romanian students.” Without letting me answer to confirm or deny the accusation, he said: “Is she pretty? Have you kissed her yet?” Again without waiting for an answer he congratulated me. I explained that in America any student or single man can have a girl friend and the notion of a mistress does not exist. My interview ended and Bibescu returned to the other room where the others were waiting and said a curt, “Good-bye” and held the door open as everyone left. As I left he said “I hope you will come and see me in Washington.” Of course all the students wanted to know how much money each one, including me, had received. We parted on a false note of friendship. The day after my meeting with Bibescu, I received a telegram from him in Washington inviting me to dinner at the Romanian Legation!. I was inclined to decline because of the cost of the round-trip train fare. However, I accepted and went to Washington. I was met at the train station by Serban Drutu, now the Chancellor of the legation, who took me to the Hotel Raleigh where they had reserved a room for me. It was a coincidence to meet Drutu again. Bibescu had given him a free hand to manage the diplomatic Chancellery. He was not a particularly able person yet seemed to think highly of himself. The next morning, Bibescu phoned me to say that Princess Bibescu would be delighted to have me for lunch. Full of excitement I went into town and bought a new suit, a shirt and a pair of shoes. When I looked at myself in the mirror I appeared ridiculous. I went to the legation where I was ushered to the Minister’s office by a uniformed valet. As soon as Bibescu saw me he rushed over and started feeling the collar of my jacket. He asked me where I had bought it and how much I had paid for it? He told me a similar suit would have cost much more in London. This seemed like an odd reception, but as I was going to find out later, Bibescu had an odd personality. Meanwhile another guest arrived, the first secretary of the French Legation. I was introduced to him as “mon grand ami Dimancescu”. Shortly after, Princess Elizabeth Bibescu came in and I was introduced to, her as “mon ami Dimancescu” without the ‘grand’. I remember that lunch started with a souffle, but I do not remember what followed. There seemed to be a number of questions that did not have answers. Elizabeth Bibescu asked me how I liked Washington, a banal question to which I replied that I had been here before and I liked it. For the rest of the meal the conversation was dominated by the French diplomat who had a bag full of news of interest to diplomats. I listened quietly as I could not contribute anything. Princess Bibescu left after lunch in a Rolls Royce. The French man left too and when I was ready to go, Bibescu asked me if I would like to work at the Legation. I told him that I had never thought of entering the diplomatic corps. Actually, I was not qualified because I did not have a degree in law. I explained to him that I had been asked to join an engineering firm. Bibescu said he would not insist and did not want to influence my choice, but added that between being an engineer in Pittsburgh or any other industrial town in America, and a diplomat in Washington, the choice was not difficult. As for the degree in law he said that was an easy matter to settle. I left and he said he would wait for my answer. He also gave me an envelope with money for my round-trip train fare. I tried to refuse but with the same persistence he would not take the envelope back. I now found myself at a great crossroads in my life: I had to make a choice between two kinds of lives. Washington tempted me, even though I had barely had a glimpse of how diplomats lived. The Legation was in lovely house overlooking Sheridan Circle. Pittsburgh was waiting for me with a good salary with a dark, artificially lit room with windows which could hardly be opened because of the thick smoke from the steel factories. Heading back in the sleeping car, I could hardly close my eyes. What direction should I take? When I went to see Hammerschlog to tell him that I had accepted a small job in the Romanian diplomatic service, he very nicely told me that he would have done the same and described to me the monotony of an engineer’s life in an office. It was not difficult to leave Pittsburgh. All my clothes fit in one suit case and the books fit in a large trunk. I did not know where I would live in Washington and did not want to burden Bibescu with my small problems. I went back to the Raleigh Hotel and spent a day looking for a furnished room near the Legation. Washington is a city with innumerable government employees, many of them single and living in furnished rooms. Easily enough I found a room on Church Street near Dupont Circle, a five-minute walk to the Legation. My new hosts, a family of three, offered me a bedroom, living room, bathroom and American breakfast for $30 a month. When I had everything in order, I telephoned Bibescu who asked me to come to the Legation right away. He took me to the Chancellery where were Drutu and Miss Helen Fitzpatrick, who had worked there for years. After a short introduction, Bibescu left us alone and Drutu assumed his role as my chief. He did not care that I had an engineering degree and told me coldly that I was not a diplomat but merely an office employee. He kept a register in which he meticulously kept columns of entries recording all the Legation’s incoming and outgoing correspondence. The correspondence files were kept in small parcels and filed in numerical order. It was impossible to locate a document if one did not know its number that had been recorded in the register. Drutu knew the numbering system by heart and could locate anything. He showed me my work place, a large mahogany desk with empty drawers. He would give me assignments every day. He started by putting the correspondence register on my desk. He showed me an eraser, saying that no errors were allowed and everything had to be neat and clean. He said that although there was a phone on my desk, I was not to use it for personal calls. Actually this phone gave me direct contact with Bibescu, who often called me to his office. After showing me the files, Drutu invited me for lunch. When Bibescu was appointed minister to Washington, Commander Pantazi and his assistants were recalled to Romania. Pantazi had accumulated over $100,000 in passport fees. These had not been authorized in Romania and no one there wanted to accept responsibility for accepting the money. Pantazi put total sum in Bibescu’s name who purchased a large house in Washington. It was a nice house but not suited for a Legation. The entrance to the first floor was on 23rd Street. A large hall on the right was the dining room and the living room was on the left. This living room is where the chancellery was installed even though it was too small for the administrative staff. From the hall, paved with large squares of white marble, there was a semi-circular stairway to the second floor, where Bibescu installed his office in the former library. He had brought beautifully bound books from England. Across from the library was a large living room furnished with rare items and a piano. Between these two rooms there was a large hall also used a living room. On the third floor were five bedrooms each with a small bathroom and a small living room. This was the personal apartment of the Minister and his wife. Their daughter, Priscilla, also lived here with her English governess. Over this floor, there were several rooms and bathrooms for three servants who had access to the basement via an elevator. My diplomatic career began in these surroundings. It had nothing of the luxury that I had imagined. I was consigned to a clerical job. There were, however, some benefits. Bibescu did not treat me as a clerk and always addressed me as “dear friend”. From the start he introduced me to some of his colleagues and invited me to dinner two or three times a week. Monthly the U.S. State Department published a small booklet, called the “Diplomatic List”, in which were listed all the foreign diplomats who were in the Unites States. In the beginning, my name was not on the list, which was a great handicap. One day I received an engraved invitation to a ball for embassy and legation personnel. On the appointed day, I went to the ball dressed in tails and white tie, but was rather surprised when the doorman told me the ball was being held in the basement. When I entered I discovered that the ball was for the servants of the embassies and legations?, Of course, I stayed and danced with the cooks and maids. Later I found that my name was not on the diplomatic list but on the servants’ list. Meanwhile Bibescu had requested Bucharest to grant me the title of “Chancellor of Legation” . After some difficulty the modest title was confirmed and my name appeared on the diplomatic list. This threw me into the social whirl of the Washington elite. Now I received three or four invitations every day and did not know how to divide myself. In those days, the Washington season was from October to March-April. Every day there were three or four luncheons and dinners of importance. In between there were 5 o’clock cocktails and there were late suppers starting at mid-night. In the beginning I accepted a lot of invitations, but I soon realized that they meant very little. Slowly I became more selective about the places I went to. The years I spent under Bibescu in Washington provided a course in diplomacy that I could not have received anywhere else. Bibescu, despite his quirks, was an extraordinary man. He came to Washington from London with an established reputation because he was married to the daughter of the ex-prime minister, Herbert Asquith. He had lived in the best English society and was accepted by all. He had been born in Paris and also been in the top society there. He read a lot of English and French literature and had many friends among French and English intellectuals. He corresponded with them by post-card. To a long letter from a friend he would reply by post-card simply “Received letter of such date. Thank you” and would sign’ A.B.’ His hand writing was impossible to read. Sometimes he would call me and ask if I could guess what he had written. He corresponded with the Romanian Foreign Ministry via very short telegrams. He said the reports he sent to Romania were never read by the Ministry of Foreign Affairs. Slowly the Legation staff grew. The first to come after me was Frederic Nanu, first secretary of the Legation and soon promoted to Counselor of Legation. He was the son of another Romanian diplomat who had married a Belgian woman while stationed in Brussels. Nanu was more of a Belgian. He spoke and wrote perfect French and spoke Romanian with an accent. But his knowledge of Romanian grammar was outstanding. He was a good Romanian language teacher for me. He had me write some of the Legation’s reports and them would check them as meticulously as a teacher would. Working with him was an educational experience. Sometimes he would have me rewrite a report three or four times. He was also an excellent bridge player and was in great demand around Washington for bridge games. His wife, Rose, had been born in Mexico and educated at a Catholic school in London. With hair the color of copper, she was very beautiful and was much courted by single and married men. Both the Duke of Sutherland and Senator Gerry, married to a Vanderbilt, asked her to marry them. With Bibescu and Nanu, our Legation was ahead of all the others in gathering political news. Bibescu was an honorary member of the Metropolitan Club where he was able to mingle with some of the top American politicians. He did not smoke or drink. At the Metropolitan Club bar he would ask the waiter to fill a cocktail glass with water and then would take sips once in a while. At the Legation dinners he served the best French wines from his well-stocked cellar. Elizabeth drank not only her share but his too and sometimes had to be stopped when she had too much. Many of the distinguished British visitors to America would make a courtesy call to our legation. If some guest could not come at the last minute, I would be routinely asked to take their place. I remember that at one lunch where Lord Balfour had been invited, I was brought in at the last minute as a fill in for a cancellation. Bibescu and Balfour had a tennis date, so I had to fill in both at lunch and at tennis. Bibescu whispered to me to lose balls because Balfour was an old man. Actually Balfour was an excellent tennis player and made me run from one end of the court to the other for two hours. 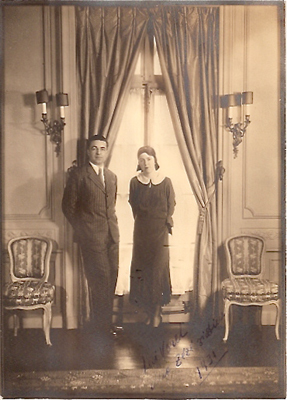 During the almost five years that I was at the legation in Washington, the administrative staff was rounded out with the addition of a Romanian woman, Geta Trister, who came from the Romanian consulate in New York. For many years Helen Fitzpatrick and Geta did the hard work of the chancellery. Our diplomatic mission consisted of: Anton Bibescu, minister plenipotentiary, Frederic Nanu, counselor, and myself chancellor. The diplomatic work was done by Bibescu who had set out to resolve two problems: the recognition of Bessarabia as part of Romania by the United States, and the settlement of inheritances of Romanian immigrants. The United States felt that Romania had annexed Bessarabia at time that the Russian people could not speak their word. Various writers and newspaper men supported the Romanian cause, but the State Department would not budge. The second issue involved mainly Romanian immigrants who had died in industrial accidents and whose insurance policies left amounts of $10,000 to $25,000 to their heirs. Bibescu would have liked the 600 pending cases to be treated together and the total sum remitted to the Romanian government which would then determine who were the rightful heirs. The United States denied any responsibility, saying that the inheritances were a ‘legal matter between the state in which the immigrant had resided and his relatives in Romania. For lack of a solution, Nanu took on the responsibility of studying each case individually making this one of his main activities. Of course all the details and questions were passed on to me and I had to do all the leg work. When Andrei Popovici left the editorship of the paper “America” to assume the job of attache at the legation, he devised a solution that appeared easy but which actually turned into a disaster. The Popovici solution was to tum the cases over to a third rate lawyer, Lupear, of Romanian origin. Lupear created powers of attorney which gave him the right to represent the interests of the deceased immigrants without restrictions. He rented a whole building and was named honorary vice consul in the state of Indiana. Any amounts of money that were collected were in Lupear’s name and were deposited in his account in an Indianapolis bank. He claimed that he needed the money to cover his expenses and administrative costs. This situation provoked a scandal in which the Legation was implicated because it appeared to be covering for Lupear. The powers of attorney were finally canceled and all the files were brought back to Washington. Another important question that needed to be resolved was the matter of War debts owed by Romania to the United States. At the end of World War I, all the European allies owed money to the United States. Actually Romania had not needed a loan, but accepted it and spent it on useless items purchased from the surplus of war materials that the Americans had in France. Anyway in the U.S. Treasury accounts the Romanian debt was listed as $750,000, which Romania was asked to pay immediately. In Bucharest it was expected that all war debts would eventually be forgotten. Only one country, Finland, whose debt was about the same size as ours, paid off its debt promptly. Bibescu discussed the question of the debt with his friend Andrew Mellon, who was Secretary of the Treasury. He assured Bibescu that the debt could be settled on friendly terms and without publicity. Bibescu informed the Romanian Minister of Finance, Vintila Bratianu, that he was in a position to settle the matter quietly in Washington. But there was in Bucharest at that time an ambitious young man, Nicolae Titulescu, who was looking for a cause that would give him international visibility. He convinced Bratianu to send him to Washington with the mission of resolving the “very difficult” debt problem. He arrived in Washington with several Romanian experts: Eftimie Antonescu, Victor Slavescu, D. Ciotori, N. Badulescu and about four secretaries. This mission occupied an entire floor at the best hotel in Washington. Bibescu sent a telegram protesting against the mission, but Bratianu replied that he (Bibescu) should mind the diplomatic affairs of the Legation and leave financial matters to Titulescu. Thus started a friction between Bibescu and Titulescu. Unfortunately I helped aggravate this friction. As soon as I finished my work at the Legation I would go to the Wardman Park Hotel to visit my friends with the Titulescu mission. They had brought four large trunks from Romania with papers containing statistical data and details about Romanian state expenditures. It was out of the question that the Americans would want to translate these papers. On meeting the U.S. Commissioner of War Debts, Titulescu was going to present him with all the material contained in the four trunks. More or less casually I told him that it would better if we had photographic copies of all the material. Titulescu answered, “Bravo, you do it.” At the same time he telephoned Bibescu to ask him to let me work with the “Titulescu Mission”. Bibescu answered that he needed me and could not let me go. Furious, Titulescu replied with an outrageous insult: “You are crazy and have always been crazy”. Relations between the Legation and the mission came to a halt. Titulescu then sent a coded telegram to Bratianu, saying that he would not start negotiations with the United States until Bibescu was recalled. In less than 24 hours Titulescu had a reply from Duca, then Minister of Foreign Affairs, that Bibescu would be recalled. Titulescu had a way of insulting his colleagues with harsh words, but he did not really mean what he said. Ciotori, who was his shadow, was accused at every step of being “stupid”, “an idiot”, or “mad”. So it is possible that when he told Bibescu he was crazy, he did not really intend to offend him. Bibescu, on the other hand was obsessed with the thought that he would die insane, because his mother had died from a nervous breakdown. Bibescu and Titulescu never spoke again. In fact, Bibescu canceled a dinner he had arranged in Titulescu’s honor. After the war debt negotiations were completed, only one member of the mission, Eftimie Antonescu, remained behind because he wanted to visit Niagara Falls. I was assigned to accompany him. At Niagara, besides the beautiful water falls, there were numerous tourist gift shops. Antonescu was delighted by the Indian craft items and bought all kinds of moccasins and leather items. Back in New York we spent part of a night rewrapping these souvenirs. Then disaster … Antonescu discovered that most of things he had purchased were “Made in N.J.” and were not genuine Indian hand crafts. He yelled at me saying that I should have known. I was angered, packed my suit case and left for Washington. Antonescu chased me down at Pennsylvania Station, apologized and begged me to stay with him until his departure. Back at the Ritz Hotel we removed the “Made in N.J.” marks. We remained good friends for many years after. Soon after Dimancescu ended his service in Washington, D.C.